by acquiring career skills and opportunities through higher education. This project expands enrollment, advisement, financial aid and student support services and will impact Tulsa’s economic vitality and attractiveness for the future. > National studies show that to increase graduation rates and ensure job readiness, college students need a vast array of academic and career counseling support services. This Student Success and Career Center will have a direct impact on a ready workforce for Tulsa. > TCC Southeast Campus serves roughly 8,500 students and is the College’s largest campus, sitting on 95 acres at 81st Street and U.S. Highway 169. > By 2020, 59% of Oklahoma jobs will require a minimum of a career certificate or a college degree. Through Tulsa Achieves, TCC has more than 3,000 students attending College at no cost each year and the majority of those students attend the Southeast Campus. Studies show that for every public dollar invested in TCC there is an estimated return of $4.50. TCC has outpaced the goals set in Complete College America, a nationwide initiative to increase the number of college graduates. In order to maintain this significant graduation goal, TCC will be required to increase focus on overcoming barriers to college persistence and graduation for first-generation and returning students. 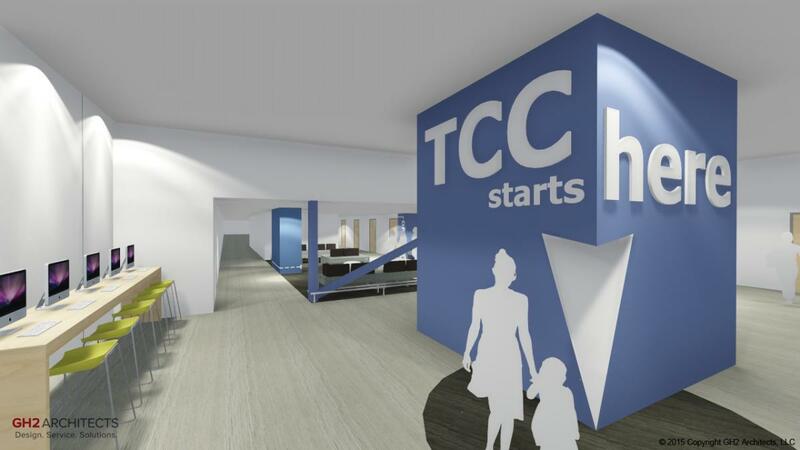 > TCC's goal is to increase its number of graduates from 14% to 20% by Fall 2018 with increased personnel and expanded facilities through the Student Success and Career Center.